It has already been a year since Peter Thiel called public attention to the bubble growing in American higher education. Yet, the cost of receiving a college degree in the U.S. has continued to grow, as student debt in the U.S. today has pushed north of $1 trillion, with the average debt per student standing at more than $25,000. With the current fiscal trajectory of our educational system now unsustainable, an infusion of new blood has begun to enter the space, and a growing number of startups and entrepreneurs have turned their focus to upgrading education’s legacy infrastructure. In turn, investors now seem ready to provide edtech companies with the type of capital that has typically been reserved for consumer businesses. The latest example of this trend is the Mountain View-based Coursera, one of a growing set of edtech startups looking to combat the rising costs now endemic to higher education with smart, scalable, web-based solutions. Traditionally, online education has been seen as an underwhelming, ineffectual approximation of its on-campus sibling — defined by micro-correspondence courses that are supplemental to the classroom experience, rather than a viable alternative. That’s why Coursera is on a mission to bring Ivy League-caliber courses to online education — for free. To help steer it down this path, the startup is today announcing that it has raised $16 million in venture funding from Kleiner Perkins Caufield & Byers (KPCB) and New Enterprise Associates (NEA). As part of its investment, veteran investor, long-time KPCB partner, and public education reform advocate John Doerr and NEA General Partner Scott Sandell, have joined the startup’s board of directors. The startup plans to use its new capital to expand its content and feature set and to continue developing partnerships with institutions in the hopes of increasing its global student body. And part of what I think defines this new set of edtech companies is the understanding that, to bring true innovation to education, issues can’t be addressed from the outside. In democratizing content and in bringing historically exclusive material to the masses, for it to be most effective, this can’t be something that is forced on institutions by entrepreneurs, but instead, in partnership. Like edtech’s top-funded 2tor and newly capital-flush StraighterLine, Coursera is partnering with top-tier universities to co-develop course material. Unlike 2tor, which focuses its web and mobile platforms on post-graduate education, and thus specific vocations, (and just like StraighterLine), the startup is looking to provide courses across a broad range of disciplines, including medicine, literature, history, and computer science. The cool part about StraighterLine is that its courses are ACE Credit recommended, meaning that they can be transferred for credit at a number of degree granting institutions. Its solution acts as a great complement to community colleges and equivalent feeder programs that funnel students into four-year institutions. In our coverage last week, I noted that the one thing missing was “big name” institutions accepting StraighterLine credit. 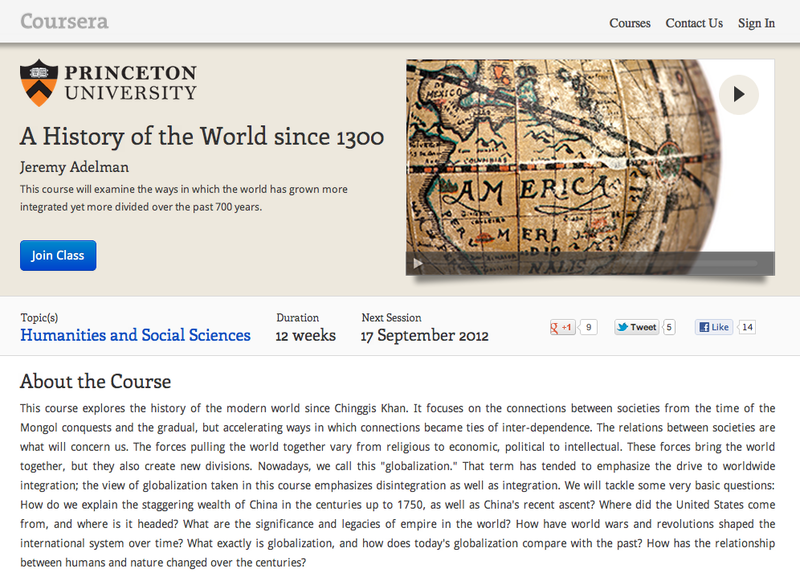 Of course, all this theoretical talk is fine, but we have yet to address what Coursera’s platform actually does. Currently, the startup’s platform includes video lectures with interactive quizzes, mastery-building interactive assignments, and collaborative community forums that encourage students to participate actively with classmates from across the globe. In other words, Coursera’s offers lectures that are broken down into 10 to 15 minute-long video chunks, with these interactive quizzes embedded into its lecture videos. It also enables students to complete auto-graded exercises that provide them with instant feedback. Naturally, it falls on the faculties of participating universities to provide the coursework. Over the last several weeks, seven courses from Stanford, UC Berkeley and University of Michigan have acted as beta testers, but the team said that it expects to launch an additional 30 courses beginning next week and continuing through late summer. Obviously, for these large-scale plays into open education to be successful, faculties can’t be half-assed in their adoption. And without significant incentive for professors, administrators at colleges often struggle to get their faculty on board for these types of initiatives. Yet, as UPenn President Amy Gutmann told Inside Hire Ed, even though they’re not offering major incentives, faculty members have gotten really excited about teaching open, online courses. Even though some edtech purists knock Salman Khan for not being a “real” (read: trained) educator, the prospect of reaching thousands of eyeballs Khan Academy-style (KA’s YouTube channel has over 100M views) certainly has its appeal. Being professors themselves, this is something the founders of Coursera understand. Daphne Koller and Andrew Ng, the startup’s co-founders are both Computer Science professors at Stanford and had previously helped develop the university’s own free online classes, which have gone on to tally 350K enrollments across 172 countries. But, what’s so interesting is that two such similar startups have come out not only out of the Stanford faculty, but out of the same department. In the same year, no less. Udacity, which was founded last year by former Stanford Computer Science professor Sebastian Thrun has a similar mission: To bring free, university-level education to the masses. Like Coursera, Udacity’s online classes are interactive and feature embedded quizzes that test viewers on the material as they’re watching. Udacity’s classes are also designed in such a way as to eschew the traditional lecture format in favor of enabling students to learn at their own pace. Coursera has a head-start on Udacity in terms of offering a more liberal arts-style education, and if Udacity opts for the Salman Khan approach of one teacher for all subjects, Coursera may be on to a more sustainable, or perhaps even more effective model, by facilitating the distribution of courses taught by those who are experts in their particular field. Either way, both startups represent an important step forward for education (and its cost) by making college-level classes accessible to anyone who wants to learn. “Higher education is ripe for innovation: it is too expensive and limited to a few,” KPCB Partner John Doerr said in a statement. “Coursera is unique in partnering with the best universities to offer free, global access to the world’s best teachers and courses. The potential is profound opportunities for personal — and economic — growth and development.” And seeing as Doerr is a long-time advocate of entrepreneurs working in public education and in 2009 was appointed to President Obama’s Economic Recovery Advisory Board to help the administration devise a way out of the country’s economic downturn, it’s safe to say he knows what he’s talking about. For more on Coursera, check out the startup at home here.